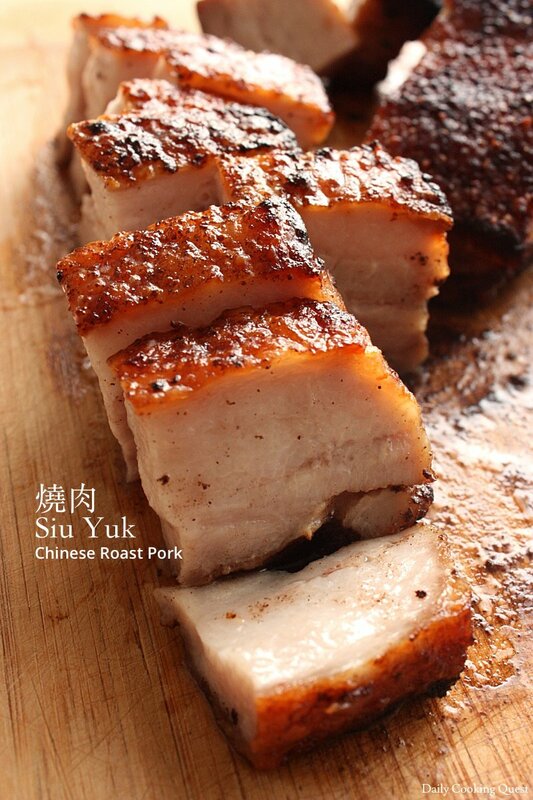 Siu Yuk (燒肉) is a famous Cantonese cuisine. And since I am raised in a Cantonese family, I practically grew up eating this all my life, ain’t I lucky? :) In restaurants, and for special celebratory occasions, a whole pig will be roasted, then cut into small bite size pieces when served. Most will use fully grown pig, but sometimes, a piglet is used and this will definitely costs more, but it is does taste better than the grown up version, so there’s that. 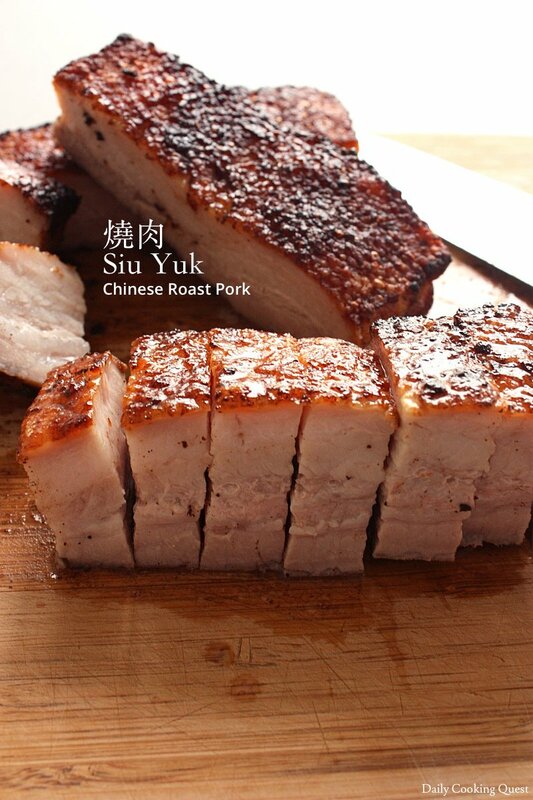 For home cooks though, cooking one whole pig is quite an undertaking, so we usually just buy a slab of pork belly, about 500 gram to 1 kilogram and roast it in the oven. 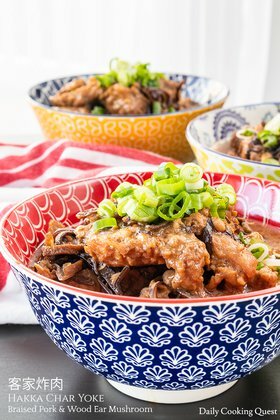 It is surprisingly quite good and super easy cooking this at home, though I admit this will never beat the ones from really good restaurants. 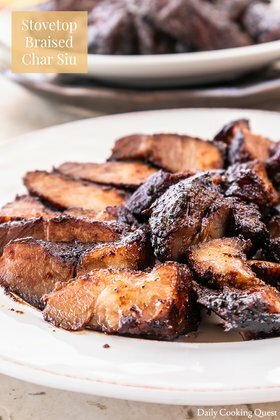 So, if you are up to it, go grab a slab of pork belly next you visit a Chinese grocery store and prepare some siu yuk at the comfort of your own home. Place pork belly slab, scallion, ginger, and Shaoxing wine in a pot. Top with enough water to cover the ingredients by about one inch. Bring to a boil, and cook for about 15 minutes, or until a knife inserted to meat no longer draws out blood. Drain and rinse under cold water. Wipe dry with kitchen paper. With a toothpick, poke holes all over the rind. Try to make as much holes as possible to get a crispy skin. Sprinkle salt on the rind, and give it a good rub. Turn over, and place the pork belly slab in a mixing bowl (a tray with flat bottom is better actually). Pour soy sauce over meat, then sprinkle evenly with seasoning mix. Cover with saran wrap, and let it rest in the fridge for at least 2 hours, or overnight. Return the meat to room temperature. Cover the lean portion with aluminum foil, so that only the rind portion is exposed. This is to prevent burning and over-cooking the meat at the first stage of the roasting. Preheat the oven to 480 Fahrenheit (250 Celcius). Line a baking tray with aluminum foil, and place a rack over it. Transfer the meat over to the prepared rack, rind side up. Roast for 30 minutes until the surface looks crispy and crackled. Remove from oven, discard the aluminum foil from the meat. Turn the oven heat down a bit to 425 Fahrenheit (220 Celcius), and continue roasting the meat for 15 minutes, again rind side up. Remove from oven. Let the meat rests for 10 minutes, then cut into small bite size pieces. Serve immediately. Your instructions are very clear . The results are fantastic .thank you again. Halo ce.. Salam kenal.. mau nanya kalo gak ada shaoxing wine apa blh di ganti yg lain ato di skip aja its ok? Tks b4..
Hi Yani, bisa pake dry sherry, kalo susah diskip juga ok.
Halo Anita, salam kenal ya... punya usul kah gimana supaya bagian kulit nya tetap garing hampir seharian? Kalo kaya restoran nasi campur dagingnya kan di gantung, trus kulit nya garing terus pas dimakan.. Makasi ya sebelumnya God bless..
Halo Simon, kalo tidak langsung habis dimakan, sebaiknya kulit dan daging dipisahkan, dan disimpan di kulkas juga terpisah. Nah, nantinya pas saat disajikan, si kulit bisa dimasukkan lagi ke oven sebentar (180 Celsius/350 Fahrenheit) sekitar 4-5 menit. Biasanya si kulit akan balik crispy lagi kalo begini. Sedangkan si daging bisa dihangatkan saja dengan microwave. Selamat mencoba.